Roadside attractions have been around since roads were dirt and farmers tried to make a few extra bucks showcasing the county’s only living two-headed chicken. As backroads linked to other backroads to make long-distance travel more practical in the 1920’s and 1930’s, entrepreneurs tried almost anything to attract travelers. They built unique restaurants shaped like hot dogs or gas stations fashioned into giant tea pots. They painted water towers to look like corn cobs. And they created really big novelty objects like massive balls of twine and bubble gum. P.T. Barnum would be so proud. Business was good until the 1950’s when workers began building the Interstate Highway System and new roads bypassed the old roadside attractions. On July 10, 1913, the temperature peaked at a whopping 134 degrees in Death Valley, California, which according to the Guiness Book of World Records is the highest temperature ever recorded on earth. To commemorate that scorching day, Bun Boy owner Willis Herron spent $700,000 in 1991 to build a thermometer next to his restaurant in nearby Baker, California. Of course, no regular-sized thermometer would be good enough for such a monumental record. Herron hired a sign company to create a towering thermometer—134 feet tall—in honor of the blistering heat record. Soon after workmen placed the giant gauge in place, giant winds crumpled the tower into a giant twisted mess. Herron rebuilt. Two years later high wind gusts again teetered the tower so much that the base cracked and light bulbs popped out. Herron, however, would not deprive sightseers the chance for photo ops in front of the soaring thermometer. He added concrete and steel reinforcements to secure the monument’s base in the ground, and its place in history. 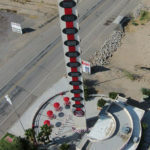 The World’s Tallest Thermometer is located near Interstate 15 in Southern California’s Mojave Desert. 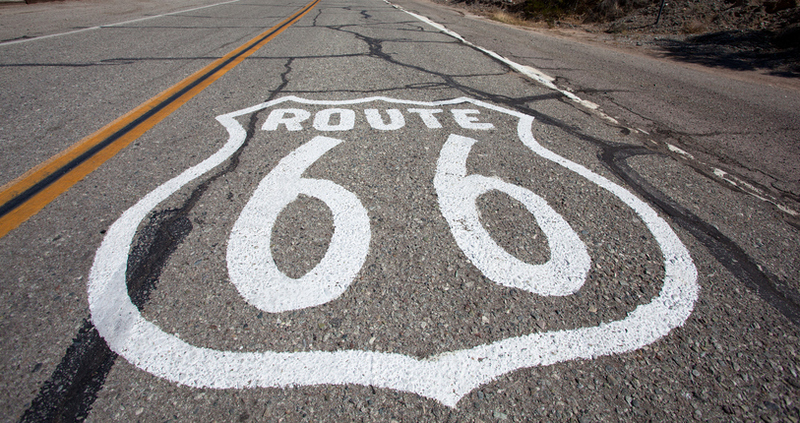 Check out the gift shop and be sure to snap a selfie with this roadside icon. You can even use the Postagram app (discussed in this previous blog post) to create and send your very own customized postcard to share your giant thermometer experience with friends and family. If you were alive in the 1880s, you had the chance to witness some of history’s most dramatic engineering achievements. You could have picnicked on the banks of New York’s East River to watch workers put the final touches on the Brooklyn Bridge. You could have watched crews set in place the Washington Monument capstone to create the world’s tallest structure (a title it proudly held until the Eiffel Tower—at nearly twice the height—entered the scene and crushed the record). Or you could have strolled along the South Jersey shoreline to see Lucy, a 65-foot-tall elephant keeping watch over the crashing waves of the Atlantic Ocean. Bridges and towers were great landmarks for other cities, but real estate speculator James Lafferty, Jr. chose the giant wooden elephant to be the centerpiece of his plan to attract tourists and potential property buyers. At the time, the party was just beginning for Atlantic City. The resort city now known for its casinos, beaches and boardwalks started as a little health resort isolated between marshlands and islands. The only way to reach its hotels, restaurants and tourist shops was by railroad, which soon began delivering more than 500,000 visitors each year. Lafferty owned land about five miles south of Atlantic City. To promote his real estate business and lure potential buyers to the rows of sandy lots dotted with dune grass, he built the colossal pachyderm to house his office. Lafferty would lead visitors up the 130 steps to the ornate carriage on Lucy’s back to show off the incredible seaside views. He would describe the benefits and luxuries of waterfront living and, when he sensed he had piqued his guests’ interest, would move to his desk in the belly of the beast to try to seal the deal. Lafferty spent $38,000 to build Lucy (a sum worth about $850,000 today). Although she was a popular visitor attraction, Lucy failed to produce land buyers for her owner. Lafferty sold the massive elephant building a few years later to cover his debt and died soon after that. Over the years Lucy has been a doctor’s office, a private home and even a tavern. She survived hurricanes and a devastating fire (started by drunken tavern customers). In 1974, new owners relocated Lucy to her current address and raised money to restore her to her original majesty. Lucy became a National Historic Landmark in 1976 and is one of the oldest surviving roadside attractions. Lucy the Elephant made a big impression on many people, including a young boy named Claude Bell. 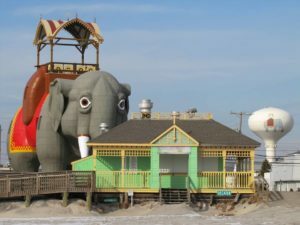 While living near Atlantic City, Claude and his uncle journeyed down the shoreline to explore the big elephant building on the boardwalk. One day, Claud dreamed, maybe he could make his very own giant creature. And he did. Fast-forward several decades to 1958 when Claude opened the Wheel Inn Café on a desolate section of Interstate 10 near Palm Springs. Business was slow. Claude needed a way to draw attention to the restaurant as drivers cruised along the highway. He remembered Lucy and his childhood dream and began building the enormous 150-foot-long “Dinny” the Dinosaur next to his café. People could see the cement Apatosaurus from miles away. By the time curious travelers reached Dinny, Claude was waiting for them too with his daily lunch special. Later, Claude gave his dinosaur a friend, Mr. Rex. The 65-foot-tall T-Rex teamed with Dinny to generate more publicity than Claude could ever have imagined. In fact, they’re movie stars. You may have seen them in Pee Wee’s Big Adventure or The Whiz. They also appeared in music videos including Tears for Fears “Everybody Wants to Rule the World” and “Supersonic” by Oasis. They were also featured in the opening credits of the classic road trip flick National Lampoon’s Vacation. Claude died in 1988 and his family later sold the property. Although the Wheel Inn Café no longer serves blue plate specials, the new owners have expanded the dinosaur-themed exhibit. You can now take a break from your desert excursion to explore over 50 life-like fiberglass and robotic dinosaurs, look for bones in dinosaur digs and fossil panning, and of course, walk through the dino duo that started it all. 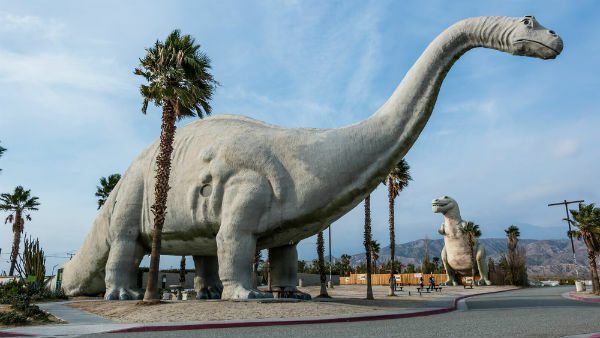 Roadside attractions have been part of the American travel experience since Henry Ford introduced the first Model T, and they’ll continue to lure tourists to see oddball objects and oversized wonders until cars no longer need roads. Want to see Bigfoot plaster prints? No problem. How about trained bears riding scooters? They’re out there. Maybe you want to camp near a UFO Watchtower for the chance to see the ultimate roadside attraction visitors. You can do that. The world of the roadside attraction is bizarre and campy and filled with history…and shouldn’t be missed. As always, whether you’re sliding behind the wheel for a long road trip or just driving a few blocks to the store, staying safe is important. 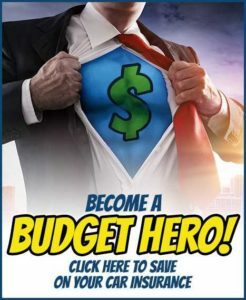 To learn about safe driving techniques, or to find out if you qualify to reduce drivers’ license points, dismiss a traffic ticket, satisfy a court order, or even earn a discount up to 10% off car insurance from participating insurance companies, visit www.drivesafeonline.org.